COMMERCE, Calif. /California Newswire/ — The FootMate(R) System by Gordon Brush has acquired a powerful partner. The American College of Foot & Ankle Orthopedics & Medicine ("ACFAOM") has endorsed the FootMate(R) System. 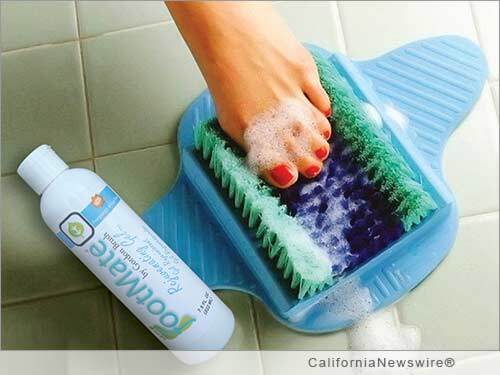 It is a complete foot care system for cleaning, soothing, stimulating, and massaging feet in the shower. Stephen Albert, DPM, FACFAOM, President of ACFAOM, noted, "We have evaluated the FootMate System and believe that it will provide significant benefits to people with foot and ankle issues, the elderly, or people with mobility problems. We also think that the FootMate System can benefit people with tired and sore feet or for anyone wanting a way to clean and massage their feet." Norman Wallis, PhD, ACFAOM's Executive Director, added, "The collaboration with Gordon Brush and ACFAOM's endorsement of the FootMate System, will provide our members with a value added product that they can offer their patients to help maintain good foot hygiene." "In addition to opening up the door for us into the podiatric professional market, the ACFAOM endorsement supports our belief that the FootMate System promotes improved foot health for the elderly, people with foot and ankle issues and reduced mobility, and anyone wanting a spa like feeling at home," said Ken Rakusin, President and CEO, of Gordon Brush. ACFAOM is the only Specialty Organization affiliated with the American Podiatric Medical Association ("APMA") that represents the full scope of the medical, orthopedic, and biomechanical aspects of podiatric practice. ACFAOM, with a membership of approximately 1,000 doctors and 450 student doctors, is a national organization of highly educated and trained podiatric physicians dedicated to assuring that primary podiatric medicine, broadly defined as orthopedics and medicine of the lower extremities, is the cornerstone of contemporary podiatric practice. For more information on the FootMate System, visit http://www.FootMate.com/ . Gordon Brush Mfg. Co., Inc. is an ISO 9001:2008 certified and leading manufacturer of specialty, custom and standard brushes for industrial and consumer purposes. The company makes the FootMate(R) System as well as over 15,000 other medical, industrial, janitorial, and electronic brushes at its manufacturing facility in Commerce, California. It stocks over 2,000 different brushes for same day shipment selling to a variety of industries including medical, electronics, manufacturing, military, aerospace, and pharmaceutical. Gordon Brush has been featured on the ION Network, Discovery Channel, Bloomberg News, The Real Talk Show, and in the Los Angeles Times.